As is now customary, the PistonHeads.com Photography Forum had a thread to share your top five photos from the previous year, in this case 2018. As I had selected my five photos I also decided to share them on my blog, as I have done for 2017, 2016 and 2012. 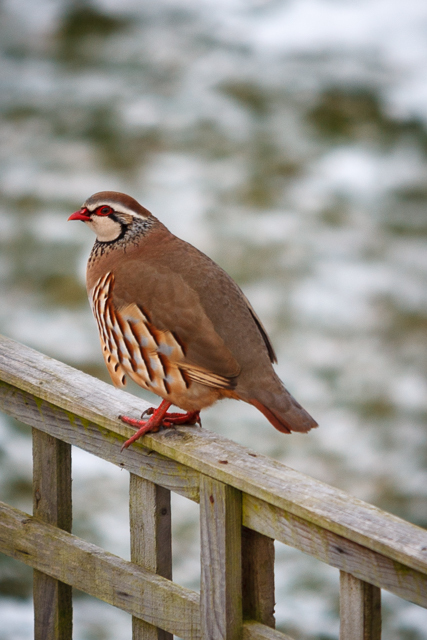 I was surprised to open the curtains in Owen’s bedroom on morning to see a partridge perched on our fence (annoyingly nowhere near our pear tree). I grabbed my camera, opened the window and took a few shots before it flew off. The was the only photo I took with my old Canon 70-200mm lens last year – I love the quality of the image, but the fact that the lens did not even leave the house was part of my reason for part exchanging it towards my Fuji kit. Jen and I love the Sandleigh National Trust Tea Room in Croyde, their cream tea is the best I have had! 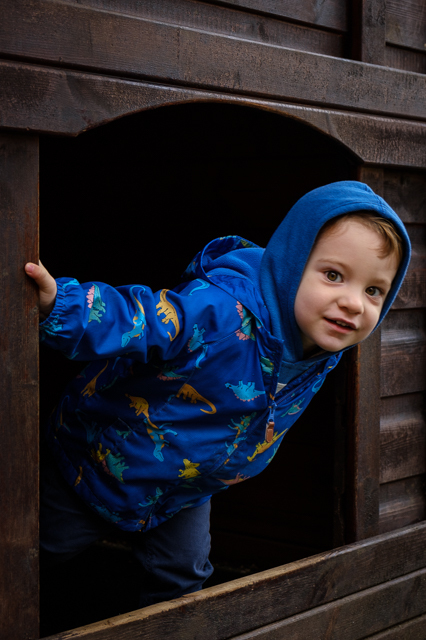 With an inquisitive toddler, the fact it is in a walled garden is great, Owen could explore on his own, still in the safety of the garden. The was one of the first portraits I took with my Fuji X-T2 (using the kit lens) and I was really pleased with how it came out. Another shot from our trip to Croyde, although this was taken from the Capstone Parade in Ilfracombe. It was the first real landscape shot I took with my X-T2 – and ideal for trying out the Velvia film simulation. Since swapping my heavy Canon camera gear for a lighter Fuji set up, I am more likely to have my camera with me. In the past I would not have taken my camera for an excursion to the playground, but the little Fuji is great for this sort of trip out and means I can get photos like this one of Owen! He was playing hide and seek in this little cabin, so I set up the shot and waited for him to pop his head out. I really feel that Owen’s personality is captured here. 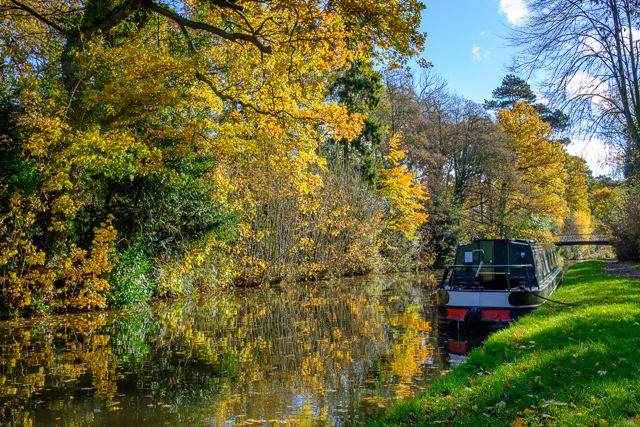 I posted this photo from the Trent and Mersey Canal just after taking it, but it made my top 5 because I like the colours and the reflections. It has been a month since I swapped from my Canon full frame DSLR to my Fuji X-T2 so I thought I’d put down some more detailed thoughts, incase anyone else is considering the switch. The main point is that it has got me excited about photography again! This may just be the new kit effect, however the smaller/lighter camera is also opening up more options for me. There also seems to be a lot of excitement around mirrorless cameras at the moment, especially given the announcements at Photokina the other week – you know something is becoming mainstream when even the BBC is reporting about it! The first real test for the X-T2 was the family holiday to Croyde, this gave me a great opportunity to shoot a lot and get to know the camera. 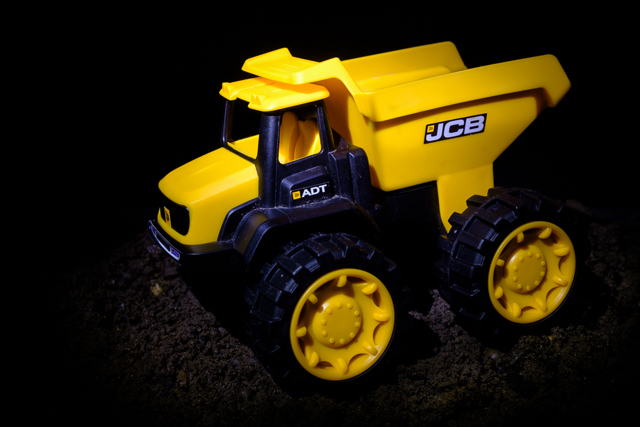 Most of the photos I took were of Owen – it is handy having your own mini, almost tame, model that you can take around with you! This meant the auto focus mode got a lot of use! Going from 9 auto focus points on my old Canon, to 91 on the Fuji was simpler than it sounds, once I had got the hang of the various modes. At first I was using the wee joystick on the back to select individual focus points – revelling in the ability to place the focus point almost exactly where I wanted it. That was until I discovered the face detection setting – when activated the camera sets the focus point on the human face nearest to the centre of the frame. 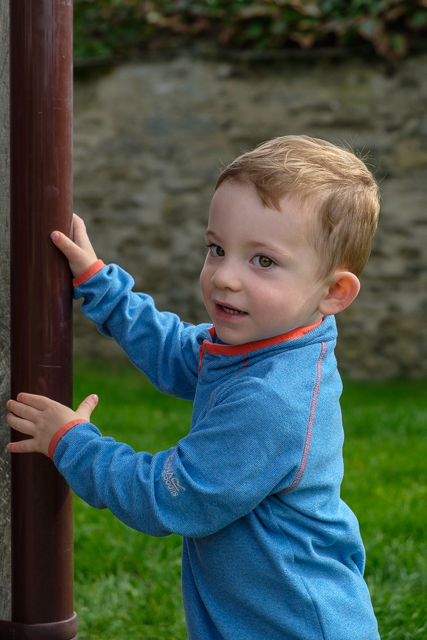 It seems pretty reliable and is certainly quicker than manually selecting focus points, especially useful when your subject is a wriggly two year old! Focus check – as soon as you move the focus ring (in manual focus mode) the image in the viewfinder/on the rear screen is magnified allowing you to check your focus in greater details. You also can use the joystick to move the zoomed in area around the frame, for when you are focussing on something away from the centre of the viewfinder. Digital split image – the viewfinder image is split in three, where they line up is the area in focus. This reminds me of borrowing my Dad’s old Nikon FM2, a fully manual film SLR, which to the day is still the best manual focus system I have ever used. Unfortunately the Fuji still isn’t as good as the old Nikon. Focus peak highlight – which highlights the in focus high contrast images in a bright colour in the viewfinder/on the screen. I find this easier to use than the digital split image, especially in combination with the focus check feature. Distance indicator in the viewfinder/on the screen – show you the distance you are focussing on, including a depth of field indication, which changes with aperture. Having the camera mounted on the tripod for the still life photos gave me a chance to experiment with controlling the camera over wifi, using the Fuji app on my iPhone. Unfortunately the app isn’t as user friendly as the camera, and I found it pretty restrictive. For instance I couldn’t work out how to get from shutter priority to manual control and even with the drive mode switch for the camera set to “Bracket” it would only take one photo, instead of the three I expected it to take. In the end I switched the wifi off and used an old mechanical release cable I had left over from my film photography days. The only other problem that has arisen from swapping camera system is that Lightroom, the software I’ve used to edit images since 2007, doesn’t work brilliantly with Fuji raw files. This is something that is well known, and was a concern of mine before switching, but I had done some testing and not had a problem. However when I was working on the photos from Croyde I noticed a few worm like artefacts, which weren’t present in the jpeg files from the camera. Capture One, an alternative program to Lightroom, has recently announced that they now support Fuji cameras, I’ve had a quick dabble and they seem to handle the raw files significantly better than Lightroom. However there are other downsides, so this is something I need to investigate further. 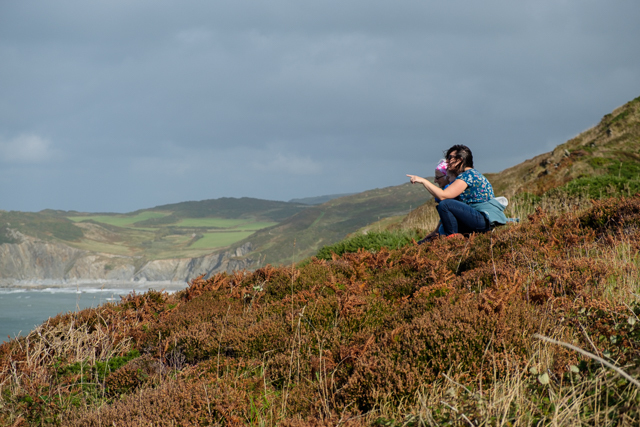 Croyde, in North Devon, is one of my favourite places in the world! Ten years ago I visited for surfing trips with my mates, and fell in love with the village and beach. I have been back every year since. This year we visited again for a family holiday, with Owen and my parents. Owen has visited Croyde before, but Mum and Dad haven’t, so I was looking forward to showing them around our usual haunts. Two years ago Jen and I drove down in the MR2, with minimal luggage, however this year the BMW was stuffed full of luggage, and a bike on the roof. I am going to need a bigger car! Traffic on the M5 wasn’t great, but Owen was a good boy, so the journey wasn’t too arduous. We met Mum and Dad at the holiday cottage, unpacked and formed a plan to head to Squires fish and chip shop in Braunton for dinner. The first of our regular haunts! After the long drive I didn’t feel like being crammed into the BMW again, so chose to ride over on my bike. I took the back roads to Braunton. It was a big climb out of Croyde, but the views down over Saunton Sands were worth it. The descent down to Braunton was fast. I was on the road, so without any tricky corners or rocks to negotiate I only had to slow down for a couple of cars coming the other way and made good time. I arrived in Braunton before the rest of the family, within twenty seconds of the time Google Maps had predicted it to take! I’m sure the fish and chips tasted even better than usual after riding over to get them! (I did wimp out for the return journey and got a lift back in the car – I didn’t fancy the narrow lanes in the dark). We started our first full day in Croyde with a walk into the village, although Owen really wanted to go to the beach! Mum and Dad walked over to Saunton Sands, and Jen and I took Owen to the beach. He was in his element playing in the sand, digging and looking for shells! In the afternoon we walked up to Sandleigh tea room. Owen had fun exploring the garden and chatting to the scarecrow, whilst we enjoyed a lovely cream tea. Mum and Dad walked to Baggy Point, whilst Jen, Owen and I went back to the beach. As the tide was out we could clamber across the rocks from Sandleigh, rather than walking back along the road. At first Owen seemed a bit unsure, but he loved splashing through the rock pools and looking for creatures. However, he was even more excited to get back on the beach to dig some holes! In the evening he came up to me, gave me a huge hug and said “I love you Daddy” – the first time we’ve heard him say that. He is such a little charmer! The weather forecast for Sunday was for rain, but we managed to get to the beach for an hour before the rain started. Owen did more digging and I flew my old Flexifoil Stacker kite. Owen had been captivated by someone flying a kite the previous week, so I thought he may be interested, but it was a bit too powerful for Owen to have a go with. The rain started just as we were walking home; we made it back without getting too wet, and spent the rest of the morning chilling out at the house. Whilst Owen had his nap, Jen and I escaped into the village on our own for a quiet cup of tea and a piece of cake! As we got back, Mum and Owen were heading out to the playground, so we joined them. It was good to get Owen out of the house and running around a bit. He also got to see the beach tractor – I don’t think it can get any more exciting for Owen than a tractor on the beach! We finished the day with Sunday lunch at the Manor House Inn, another Croyde tradition for Jen and I. The only problem was that due to it being a rainy Sunday the carvery had been hit hard. The roast beef, that I had been particularly looking forward to, had all gone. At least it gave me an excuse to try something else from the menu – the steak and ale pie was a good substitute! I thought it was funny that most of the other tables were also families with children and grandparents. As I hadn’t managed to get out on my bike on Sunday, I got out on the Monday morning instead, before meeting Jen for breakfast at Blue Groove – our favourite cafe. I have already posted about my ride, so won’t fill a holiday post with bike talk. When we got back Owen wasn’t too keen on going for his nap. 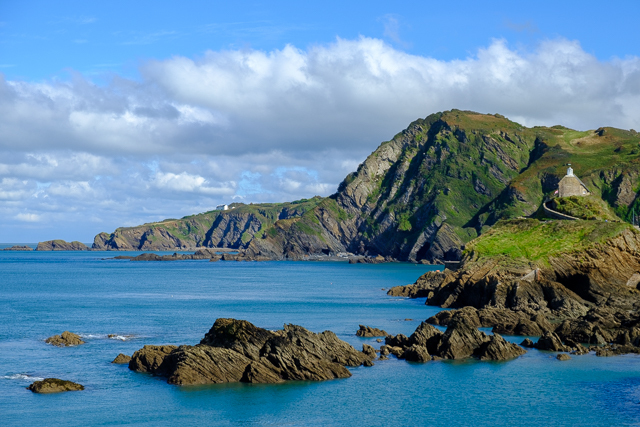 The weather wasn’t great either, so Jen and I took him out for a drive to Ilfracombe. Owen was looking forward to seeing boats and trains, even though I had explained that there wasn’t a railway there. We parked at the harbour, so saw the boats, then at the end of the harbour we saw a little road train! We had to go on it, even if it was just for a little tour of the town, most of which we’d seen from the car on the drive in. Owen was very happy with his train ride and it gave Jen and I the chance to scope out ice cream shops. Joey’s looked the best, so we put that theory to the test. My Bakewell tart ice cream was nice, however Owen ending up wearing most of his bright green mint chocolate chip ice cream. To work off our ice creams we took a walk around the Capstone Parade, a traffic free promenade around the Capstone, a small hill between the town and the sea. It was good to let Owen have a run around without needing to worry about traffic. I also got to do some photography, I was particularly pleased with the photo above, looking past St Nicolas Chapel and the harbour entrance. By the time we got back to Croyde the weather had improved, so we went straight back out to the beach with my Mum. Owen enjoyed more digging and filling his bucket with water from the rock pools. It really was great having the beach a five minute walk from where we were staying meaning that we could just pop down to the beach after whatever we were doing during the day. After dinner, I went back to the beach to try and do some golden hour/sunset photography, however the light was rubbish. I should have listened to my Dad, who had declined to join me – as he thought the light would be rubbish! Owen was in a funny mood on Tuesday morning, the weather wasn’t great either, so we had a quiet morning. We popped in to Braunton to do some shopping, then I took Owen to the playground. After lunch Mum and Dad walked to Mortehoe. Jen, Owen and I drove there in the car to meet them. Then we all walked down to Morte Point. The walk was about a mile, but as it was over footpaths/parkland we couldn’t take Owen’s pushchair -this would be his first hiking experience! He did better than I expected, I only ended up carrying him for about two thirds of the way. When we got towards the headland the wind was incredibly strong – the back end of Storm Helene was battering the UK. Mum, Jen and Owen held back and looked for seals in the sea, whilst Dad and I continued to the end of the point. It was probably a good job that Owen didn’t go all the way down with us, as Dad and I were getting blown about by the wind and struggling to stay upright – Owen would not have stood a chance of staying on his feet! After all that effort we went to Bllly Budd’s for dinner. The plan had been to get pizzas, but none of us ended up ordering one. I had a massive bowl of nachos with pulled pork, which I struggled to finish! Owen seemed to enjoy his fish fingers, but playing on the playground was his favourite part of the meal. I was impressed that he’d learned to climb up a rope net to get on the slide – he is getting very good at climbing! Wednesday the 19th September was mine and Jen’s third wedding anniversary – time has shot by! Owen woke himself up coughing before 5:00 – I thought it was going to be an early start, but by the time I got back upstairs with the Calpol, he had fallen back asleep and didn’t wake up until 8:00! Thanks for the anniversary treat Owen! My Mum had offered to look after Owen all day, so Jen and I could have a day out – Jen wanted to visit Dunster Castle, so that’s what we did! I’m not normally a fan of stately homes, but fortunately Dunster Castle is a bit different! The sun was out when we arrived, so we had a walk round the gardens, taking a selfie on the Lover’s Bridge. Then we visited the working water mill, which was milling flour. It was great to be able to not only see the mill working, but be able to clamber around both inside and outside the building to get a closer look at the whole system – from the channels taking water from the stream and over the wheels, to the gearing inside powering a variety of machines, in addition to the milling stones. Naturally we couldn’t leave without buying a bag of the flour we had seen being milled. After the mill we visited the tea room and had my favourite holiday lunch – a Cornish pasty followed by a cream tea! As the weather was now turning, we decided to head inside and check out the castle. First stop wast the crypt, to learn about the life of the servants in Victorian times, and the resident bats. We had hoped to do the Victorian kitchen tour, but it was fully booked – if you’re planning on visiting Dunster Castle, make sure you call at the castle reception and book on as early as possible! Instead we did the self guided tour of the castle, which focussed mostly on its heyday, around 100 years ago. I particularly liked the dining room and adjoining blue 1950’s kitchen with views over the Bristol channel to Wales. 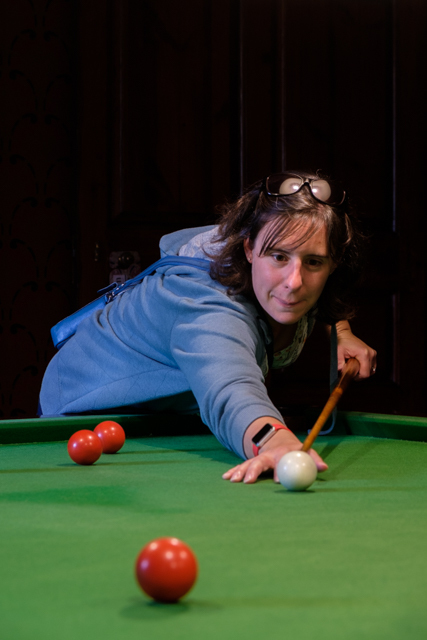 When I heard that you could try billiards, I instantly thought of a photo opportunity with Jen looking down the cue and was pretty happy that I was able to pull it off, especially given I am still learning my Fuji camera. It seemed like we had missed the worst of the weather, as back in Croyde Owen and my parents didn’t even make it to the beach – they had to turn round as the wind from Storm Ali was whipping sand into Owen’s face. They went to the playground instead, ironically it was too windy to fly the new kite that Dad had bought Owen. In the evening Jen and I went back to Blue Groove for an anniversary dinner, just the two of us. Both of us had our usual dishes, chilli beef burrito and moules frites. The weather was rubbish for our last full day in Croyde, after Storm Helene and Storm Ali rained on us we had Storm Bronagh. I’m not sure what we did to deserve three named storms on our holiday week! Dad and I braved the rain and walked to Blue Groove for breakfast and that was it for the morning! The weather hadn’t improved much after lunch, and Owen was in a funny mood, so we decided that there was only one thing for it – soft play. Jen found Quince Honey Farm in South Molton, which sounded more interesting than normal soft play and would give Owen a chance to nap on the drive there. At the honey farm we learned about bees, their hives and tried some different types of honey. When we got to the soft play area we were the only ones there! This meant I didn’t feel too guilty about taking Owen on the big slides etc. Once again he got to show off his climbing skills and graduated from sitting on my lap on the slides to racing me down! We had saved The Thatch for our final evening in Croyde and all had a good meal, making up for the miserable day. Owen was on top form, eating most of his dinner and charming the staff. Our week started with a bit of a panic, Jen left for work and the power steering failed on her car. Fortunately I had decided to drive the MR2 this week and had already moved the car seat over, so she was able to take the BMW. As my friend Richard pointed out on Facebook – there always seems to be something wrong with one of our cars! It must have just been dodgy Italian electrics, as the car was fine when I tested it later in the day. Owen and I enjoyed being back out in the MR2, he had been really sleepy during his breakfast, so I bundled him straight into the MR2 to drive to my Mum and Dad’s house. Being in the MR2 perked him up and I had lots of smiles and giggles from the passenger seat, until he eventually drifted off to sleep. We had a lovely time with my Mum and Dad, Owen seems to have learned some new skills too – waving and drinking from his cup without any help! On Tuesday Owen had some more firsts – I needed to do some more DIY, so Jen’s Mum came to look after Owen. 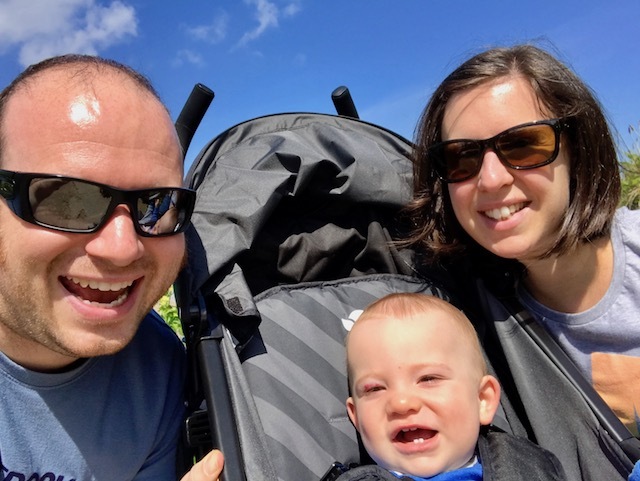 They went for a walk to the park, where Owen enjoyed the playground, incuding trying the slide for the first time, then they came home on the bus – Owen’s first bus trip! When he got back Owen seemed content watching me paint – finding it funny when I was up the ladder waving down at him. This is sounding a lot like my parental leave is just handing Owen over to grandparents to be looked after, whilst I crack on with something else – which isn’t the case. I guess the routine stuff, like battling with him eat his breakfast, changing nappies and playing peekaboo just seem normal to me now, so tend not to mention them. It isn’t all bad, as Owen does love hanging out with both his Grandma and Nanny. He always has huge smiles for them when they walk in the door and I’m sure he’s on his best behaviour when they are in charge! Wednesday was a Daddy and Owen day, we mostly hung out at home, our only trip out was to the supermarket, taking the long way home, as it was a nice day and we were in the MR2. I still find it funny how small the MR2 looks, parked next to all the SUVs and people carriers in the parent and child spaces. On Thursday we were out in the MR2 again, to go swimming – this week we even made it on time! Owen did a lot of splashing when we got into the pool, he splashed himself, the other babies and parents, the teacher, but mostly he splashed me. After his initial excitement, he didn’t seem to enjoy the lesson as much as usual. I think that he was tired, as he didn’t have a pre-swim nap – probably why we made it to the lesson on time. He went straight to sleep when we got home, allowing me to get some jobs done, then have an uninterupted lunch with Jen! In the afternoon Jen took Owen to buggy workout, leaving me free to get out on my bike. With all the veranda painting it felt like I hadn’t had a proper ride in ages, so it was good to be out again, even if I had to do some more painting when I got home. Whilst I was painting Jen took a phonecall that would slightly change our plans for the rest of the week – our holiday rental in Croyde would be ready for us on the Friday, rather than the Saturday. Naturally we jumped at the opportunity to have an extra night in our favourite place. Friday morning was spent packing, whilst waiting for the health visitor to come for Owen’s twelve month development check – of course Owen fell asleep just before she arrived and had to be woken up to be measure and weighed. He apears to be doing fine though, he is above the 75th centile for weight and 90th centile for length, when corrected for being born 6 weeks early. We had a few final errands to run before we could hit the road – Owen even cooperated and fell asleep in the car for the exact amount of time it took me to remove the bike carriers. We set off at 17:30, half an hour later than planned, mostly due to Owen being fussy about eating his dinner. Jen drove the first stint through the Friday rush hour traffic on the M42 to Glocester services, where we stopped for dinner/milk and a crawl round the play area. I took over for a long second stint all the way to Croyde, by this time the traffic had cleared and we made good progress. The downside to the late arrival was missing the view across Croyde Bay when driving round Down End Point, one of my favourite views anywhere in the world. We could just about tell that the tide was in, but couldn’t see much else. We found our chalet, complete with cot already set up for Owen, so all we had to do was transfer him from his car seat to the cot. It didn’t quite go to plan though, Owen woke up, and was keen to explore his new surroundings. He slept well when he drifted back off to sleep, and had a bit of a lie in. The fun really started when he’d had his morning milk and realised that he had the full run of the chalet – heated laminate floors and no stairs must be perfect for crawling around, as Owen looked to be enjoying himself immensly. He then found the springy door stoppers, hours of noisy fun for a little boy! Due to getting to Croyde a day early, and our early morning wake up call, Jen decided to do Parkrun in Barnstaple. It was a lovely morning, so Owen and I expolored the park whilst Jen ran. The plan had been to stop off for breakfast in Braunton on the way home, but Owen fell asleep in the car on the way, so we carried on back to Croyde and went to Blue Groove instead. This was no hardship as it is one of our favourite places to eat anywhere in the world. We spent the afternoon walking around Croyde and seeing what had changed since our last visit, then chilling at the chalet during nap time. We visited Squires fish and chip shop in Braunton, another of our favourite haunts, for dinner and Owen had his first taste of fish and chips. He didn’t quite get the concept, as he only seemed to want the chips. 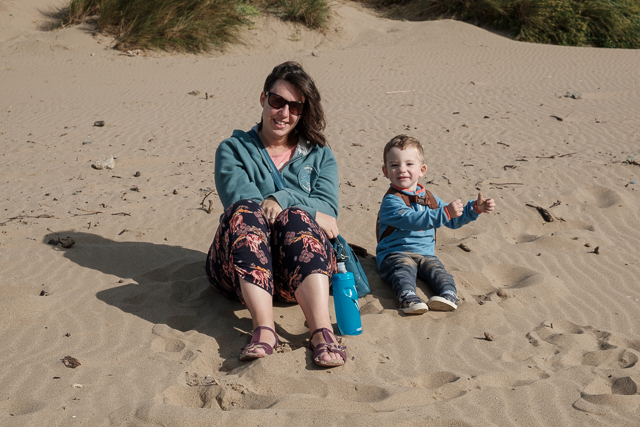 Owen seemed to enjoy the beach and did really well with not eating sand until just as we were packed up and about to leave, when he somehow ended up with a big face full of sand and cried most of the walk back – I’ve never had such a noisy rucksack! After desanding ourselves we all went for Sunday lunch at the Manor House Inn, followed by an ice cream from the little ice cream shop, introducing Owen to more of our Croyde traditions. After Owen had gone to sleep I went back out with my camera, planning to take a photo of the sunset, however it wasn’t to be, the sun dipped below the horizon, but there wasn’t even the faintest glow of orange in the sky. It was still good to get out with my camera, as I haven’t had much of a chance to do landscape photography recently. We have got more of the same planned for next week, although the weather forecast doesn’t look as nice. Whatever we get up to it is nice to spend a decent amount of time together as a family and hopefully Owen will benefit from it. 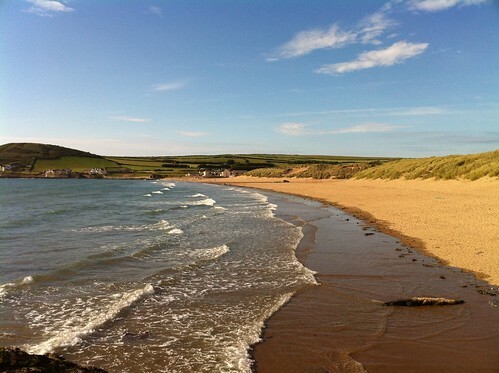 Croyde Bay, a photo by Lewis Craik on Flickr. A quick iPhone photo looking over Croyde Bay in Devon, one of my favourite places to be, even when the waves are small, like they were when this was taken.